Stephen P. Schwartz is Professor Emeritus in the Department of Philosophy and Religion at Ithaca College, New York. He has published numerous articles in leading analytic philosophy journals. "As far removed as I am from my own university studies inthe history of philosophy, I found reading the book a bracingrefresher of things learned long ago (and sometimes forgotten) anda source of more than a few new insights on familiarcontroversies." "Summing Up: Highly recommended. Lower-and upper-levelundergraduates." (Choice, 1 December 2012)Stephen Schwartz's A Brief History of Analytic Philosophyprovides an engaging, non-technical historical introduction tocentral themes in analytical philosophy, the dominant approach tophilosophical issues in the English-speaking world since the onsetof the 20th century. 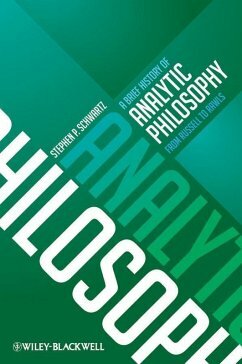 Schwartz illuminates topics for novicesand specialists alike by tracing their sources to pressing disputesamong mathematicians and scientists as well as philosophers. Thebook, captivating in its own right, will prove especially usefulwhen read alongside targeted original sources. There is nothingelse quite like it.